Jon, Chris, and I saw the Foo Fighters and Serj Tankian (singer from System of a Down) at MSG tonight. Amazing show. The crowd was not really what I had expected. The three of us started the mosh pit. Me. Starting a mosh pit. Ridiculous. But it happened tonight. Many times. By the end, we (met | had physical contact with) a nice group of guys, and one crazy girl, who felt the same we did. Sadly, no good concert injuries to speak of. I banged up my knee and elbow a bit, and Chris drew a little blood, but nothing like the guy who broke his leg. By standing there. We had nothing to do with it. Honest. 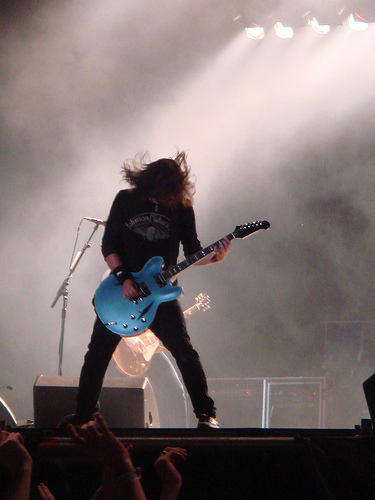 Photo credit: Dave - Foo Fighters by gajbireland. Licensed under CC Attribution-Noncommercial-No Derivative Works 2.0 Generic.